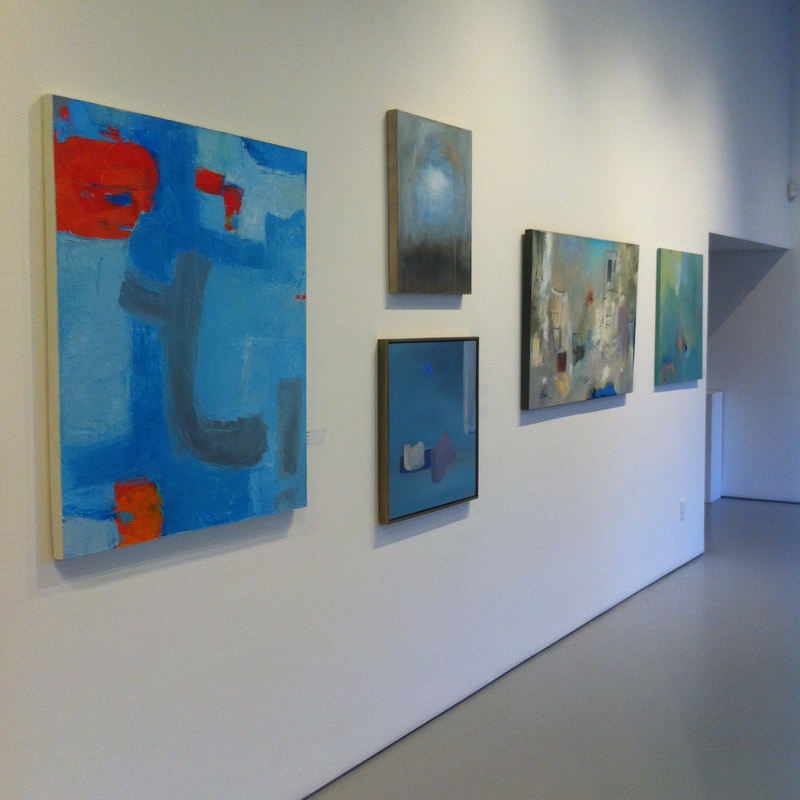 Using cerulean, the range of hues that echo the blue colours of the sky, local artists created some stunning abstract paintings as part of a group exhibition for the CityScape Community Art Space in North Vancouver. Programmed by the North Vancouver Arts Council, the themed exhibition Cerulean runs January 30-February 28, 2015. The gallery seems aimed towards the local non-art community with the intention to transition them into the art world in a less intimidating manner. I derive this assumption from the informal atmosphere of the gallery itself rather than the quality of the art works. I have frequented a lot of museums and art galleries but never one that was publicly funded and managed. Knowing it is the government funding local artists, I feel it alters the experience for the public and the frequent art goer. 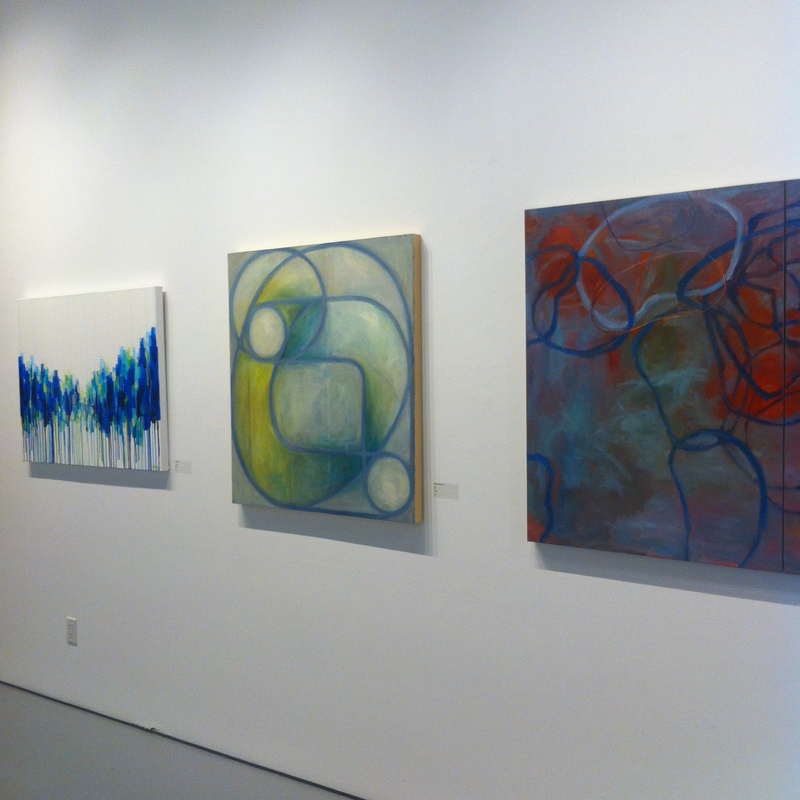 This group exhibition is tied to a themed challenge of creating an abstract artwork that incorporates cerulean blues. It was put out to the local community and all submissions were considered before the North Vancouver Arts Council chose a select number to showcase. Each work in the exhibition also comes with a price tag, stuck next to it on the gallery wall. They are for purchase, though whether the money goes to the council or artist or both is not advertised. An interesting aspect of this exhibition is that it is paired with an Interactive Community Component. The public are invited to join in on a presentation that is relevant to the exhibition. Maria Josenhans hosted Understanding Colour, a lecture on colour, pigment and tips on how to use and understand those in painting. Though I know of the small galleries in City Hall and the District Library I wasn’t aware of a stand-alone gallery space related to the North Vancouver Arts Council. When you first enter it isn’t a clear sign that it’s a gallery. The entrance way is very narrow and there is a wall just a few feet in front of the doorway And just before you enter the main gallery you are somewhat forced to take some documentation set up on a table the runs perpendicular to the narrow entrance hall. It gives a controlled atmosphere and feels almost on purpose; designed for the general public to be specifically guided to where they should go as if they wouldn’t know how to navigate the space themselves. The redeeming quality that changes the whole atmosphere is the actual presentation space. Once you make your way out of the entrance, the space opens up with two story ceilings and an open-concept layout. The four main walls are all utilized to display the art and there is a divider wall that stands a few feet long in the center of the space, yet it doesn’t reach as high as the ceiling. The openness remains and it even feigns a larger space as you believe there are two connected rooms. The white walls are used up liberally which works for this exhibition as you want to be able to see as many different works from the theme as possible. Standing alone in the gallery space, it is not a solemn or lonely experience. The space is bright and vibrant due to the multitude of blues from the theme that bounce off the walls and surround the viewer. There is a closeness of the works, side by side, and visually this makes the space quite busy. Your eye jumps around, caught by the vibrant palettes that most of the artists utilized. The cerulean theme is also linked to the abstract painting style and there is a huge range of interpretations of the style due to the sheer number of artists in the show. The multitude of reduced forms and movement emanating from the works guide your eye back and forth, left and right, trying to take it all in. There doesn’t feel like a specific organization of aesthetics but more like the works are presented based on the intensity of their palettes: the dark blues on one wall and the somber blues on another, for example. I find that my experience is different compared to encounters at large museums and private galleries. I have a different experience with the art itself, not because they are themed or painted by different artists, but because there is a distracting feeling that grows after learning that these are semi/non professional artworks. The community oriented, government funded nature of the show created a different feeling than professional artworks curated for the art world. Though it is described as a ‘themed challenge,’ the works are not set up to be compared to each other, but the fact that the artists are made to follow a theme suggests the artists are demonstrating that they can paint abstractly, even if that isn’t the style that expresses their subjective self in the best way. Going to the Tate Modern and seeing Cubism we see works that are tied to the very movements they define or by artists who are using a style for a self reflexive or critical purpose.The Cerulean works exhibit striking uses of colour with fluid forms and present diverse interpretations of the abstract style but I question the intuitive motivation behind each work’s production. In his writing Clement Greenberg “is convinced that there is a mainstream of art – art that matters, that is immortal.”1 For me, in regards to contemporary art, that implies works with a critical purpose behind them. Barnett Newman’s “struggle against bourgeois society has involved the total rejection of it;” an idea that motivates his style.2 Newman does not just make a rendition of an abstract painting sourced purely from aesthetics. There are social and historical preoccupations that motivate his creations. This is not to say that the Cerulean works I speak of are devoid of meaning, I just find it difficult to uncover a thoughtful critical review past the aesthetics. The intentions of the artists are hard to read into without considering the relationships to money or even competition. I say this because after reflecting on my experience, I have barely even spoken about the works themselves because it is the premise and theme that has the biggest impact on my reaction. On the surface, the exhibition seems to allow for an “emphasis on aesthetic subjectivity, as distinct from historical objectivity” which Mark Prince reduces art criticism down to.3 The gallery is typical of something like The Art of This Century Gallery; where Pollock exhibited and Greenberg critiqued. After my visual reaction to the work calmed, instead of questions that stayed close to the artist’s subjective technique, concept and purpose I found myself questioning if any of the artists are abstract painters at all. Are they attempting the style for the first time? What background or training in the arts do they hold? All these questions are derived from the ‘challenge’ that opened the possibility for an artist to take a historic aesthetic and paint with it objectively instead of subjectively. 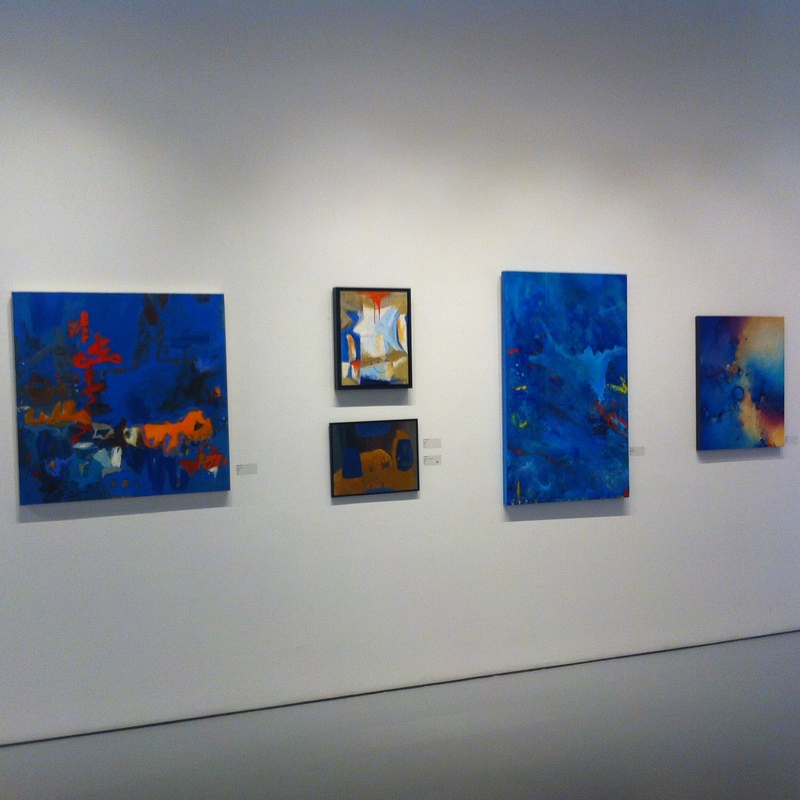 Visually and physically, Cerulean is an appealing exhibition. With works in the abstract style create something far from a static experience. The use of colour ties the individual works together and that connections between them deepens the experience in a different way than a solo exhibition, specifically in the different techniques and uses of form and colour. It is a good learning space to help teach the public about the visual characteristics of a style that is more in tune with the gallery’s purpose. In the end, art is a subjective experience and for a general public Cerulean serves as a positive space that helps mediate the local community with the art world— though it might be a more challenging visit for those looking for an academic, critical or investigative experience. 1. Sanford Schwartz, “Art Criticism: Clement Greenberg – The Critic and His Artists,” The American Scholar 56, no 4. (1987): 537. 2. Barnett Newman, John P. Neill, and Mollie McNickle, Barnett Newman: selected writings and interviews (Berkeley: University of California Press, 1992), 201. 3. Mark Prince, “Art Criticism,” Art Monthly, no. 345 (2011): 7.